Few locations can rival the peace and serenity offered by a drive along the Coast Road, taking in the breathtaking views across Galway Bay while also enjoying the convenience of being just a five minute drive from Eyre Square. Rosshill is such a location, and is home to Ross Allta — meaning ‘Wild Wood’ — a luxurious new residential development sitting on a spacious site of c8.5 acres, which has taken its name from the surrounding Merlin Woods. Ross Allta provides a sylvan setting a short distance from a host of amenities and facilities and features 16 bespoke homes that range in size from 237sq m to 284sq m.
Architects O'Neill & O'Malley have achieved an intimately scaled development by using 10 different house types, each reflecting the individuality of its spacious site. The orientation of each home, its layout and relationship with the surrounding woodlands, has given each home a unique quality. Each home is designed with A rated energy efficiency to include an air to water heat pump, underfloor heating throughout, and a heat recovery system, designed for optimal living conditions at minimal cost. High spec construction including pre-stressed hollowcore floors throughout and A rated uPVC windows and doors are just some of the standard items at Ross Allta along with generous PC sums. As well as its close proximity to Eyre Square, Ross Allta also boasts easy access to GMIT, Merlin Park Hospital, the Galway Clinic, and is within minutes of the main access routes to Galway including the M6 Galway–Dublin motorway and the new M17 western corridor. Phase 1 has just been launched which consists of just seven new homes, each with added individuality of independent access to the public road added to the woodland setting. 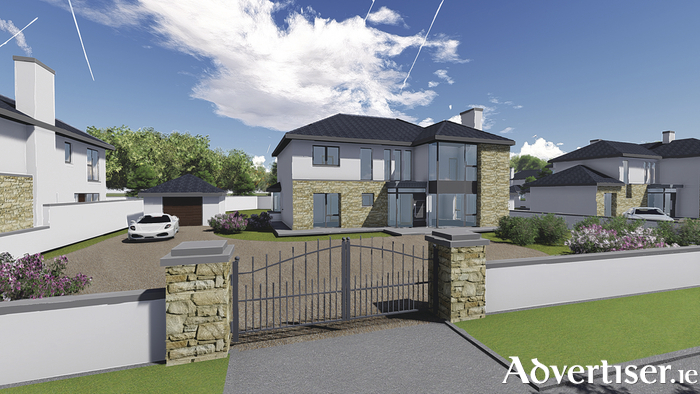 All houses are being sold from plans and www.rossallta.ie has details of each house type, floor plans, and a 3D virtual tour of the overall development as well as the houses.